for today’s best-selling, compact DSLR kits. 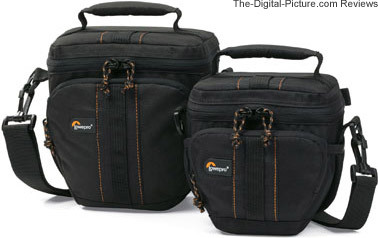 (Sebastopol, CA, August 2, 2010) – Lowepro, the leading brand of protective gear for photography equipment and portable electronics, introduces the Adventura TLZ series of toploading bags. An extension of the popular Adventura shoulder bag series, this new design offers new compact DSLR users and photo enthusiasts alike an easy-to-use carrying and storage solution for their compact camera kit investment. "Our Adventura collection offers the consumer a great value, and this latest toploading design is no exception," said Treg Tyler, Lowepro worldwide marketing director. "The Adventura TLZ is loaded with many useful and convenient features, yet it’s so lightweight and compact—you’ll find it easy to carry every day and place into a larger bag for travel," he added. The Adventura TLZ provides a snug-fitting design, sized to fit a wide range of today’s best-selling compact DSLR models. Inside, Lowepro’s fully padded and protective interior is lined in a contrasting burnt orange offering high visibility to gear. The soft, tricot lining is brushed to help protect delicate LCD screens and lenses from scratches and dust. Lowepro’s protective OverLap Zipper™ with a rainflap lid shelters gear from dust, sand and rain and covers the zippered closure while carried or stored. Durable, water-resistant outer fabrics offer additional protection from moisture and abrasion. The convenient access lid opens toward the body, so the photographer can grab gear, change a filter or battery and shoot with ease. A easy-to-access zippered front pocket with dedicated space for a memory card provides secure storage for filters, small accessories or personal items and spare memory. The Adventura TLZ offers multiple carrying options: a padded grab handle; a built-in belt loop; and a removable shoulder strap that adjusts for a custom fit and includes a non-slip patch and sturdy snaphooks for easy connections. Two stretchy, pleated side pockets round out the full list of features and provide a quick way to store and grab lens caps, accessories and other essentials. The new Adventura TLZ series is available in two sizes in Black: Adventura TLZ 25 and Adventura TLZ 15. For more information on the series and other products, please contact Lowepro or visit www.lowepro.com. • Snug-fitting, toploading design constructed for today’s best-selling compact DSLR kits. • OverLap Zipper™ with rainflap lid safeguards gear from dust, sand and moisture. • Convenient access lid opens toward body so photographer can grab camera and shoot with ease. • Dedicated storage for extra memory, filters, small accessories and personal items. Micro-compact DSLR (up to a Sony® A330 or Nikon® D3000) with lens attached (total length of camera, plus lens up to 5 in. or 12.5 cm); cords, filters or extra battery; memory card; manufacturer’s camera strap; small accessories or personal items. Compact DSLR (such as a Nikon® D5000 or Canon® Rebel with compact zoom lens attached (most 18-55mm f/3.5); cords, filters or extra battery; memory card; manufacturer’s camera strap; small accessories or personal items. Since 1967, Lowepro camera bags have been traveling the world, earning the loyalty and admiration of the best photographers, and setting the industry standard for inventive, purpose-built products. Our collections include professional-grade designs for cameras, laptops, imaging accessories and portable consumer electronics. It is our passion and privilege to provide accessible, comfortable and protective designs for our customers. Lowepro products are available around the globe, for every climate, for every condition. Wherever you go, chances are you'll find us there. To learn more about our inventive spirit, please visit www.lowepro.com.